Next I added in the branches in Portuguese stem stitch. I love the texture. It makes a bold twisted line, very branchlike. For the second red flower I decided to try out something different. For the last two flowers I changed colors entirely: I ran out of red for the kit, my friend isn’t fond of pink, and I like blue and purple. 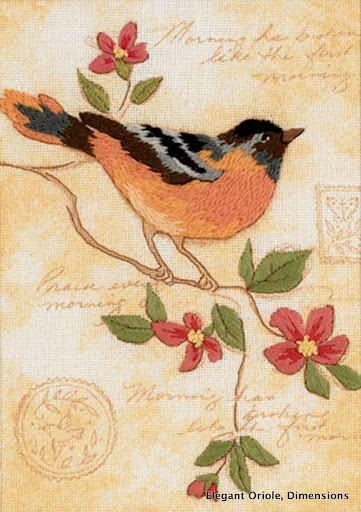 This entry was posted in Crewel, My work, Surface embroidery and tagged crewel, Dimensions, Elegant Oriole, embroidery. Bookmark the permalink. Lovely! I like what you did with the flowers, it adds punch. For some reason, I’m partial to fly stitch leaves, they create more textural interest than the satin stitch. How did you make the two lower leaves on the left? They really look interesting. I’ve posted a labeled photo with the stitches listed. That should cover everything! Beautiful and how inspiring. Make me want to run out and pick up a kit. 🙂 I like working a small one now and then, it gives me a feeling of accomplishment. I love the changes you made. It gives me inspiration to get out of the “box” …. try something new. The Portuguese stem stitch is new to me. I find it interesting. All your leaves are interesting! Your changes make the eyes linger over the entire piece. Thank you! I like to make alterations as I go along. It’s a lot of fun, and I can now tell my friend I gave her a one-of-a-kind embroidery. I used to design embroidery for kits, and I can assure you that I would be thrilled to hear of someone tweaking one of my designs to suit themselves. Well done! It’s lovely. I’m sure I have this kit somewhere, I must dig it out and give it a try.